We deal only with original photographs and paper collectibles. 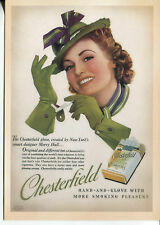 POST CARD WITH MAGAZINE ADVERTISEMENT CHESTERFIELD CIGARETTES Fast Shipping Great Customer Support Satisfaction Guaranteed DESCRIPTION POST CARD WITH MAGAZINE ADVERTISEMENT CHESTERFIELD CIGARETTES Fast Shipping Great Customer Support Satisfaction Guaranteed DESCRIPTION POST CARD WITH MAGAZINE ADVERTISEMENT CHESTERFIELD CIGARETTES Fast Shipping Great Customer Support Satisfaction Guaranteed DESCRIPTION POST CARD WITH MAGAZINE ADVERTISEMENT CHESTERFIELD CIGARETTES Fast Shipping Great Customer Support DESCRIPTION POST CARD WITH MAGAZINE ADVERTISEMENT CHESTERFIELD CIGARETTES Fast Shipping Great Customer Support DESCRIPTION POST CARD WITH MAGAZINE ADVERTISEMENT CHESTERFIELD CIGARETTES Fast Shipping Great Customer Support DESCRIPTION This is a Post Card of an Advertisement from a Magazine, Chesterfield Cigarettes. Begin Early - Shave Yourself. Light Corner and/or Edge Wear (typical for card of this age). Front Condition: G/VG. More fine material will be added on a regular basis. Back Condition: G/VG. DATE/ERA: 1950s-60s. Standard Size 3.5x5.5. ORIGINAL ADVERTISING POSTCARD - LA BRETELLE PARISIANA - BRACES. THE CARD IS IN GOOD CONDITION. Lyle's Golden Syrup. Lyle's Pure Confectionery. Liebig's Extract of Beef. Published by Moat House. We do not under declare values, or mark goods as a "gift". Item condition :New. Cerebos Salt. The Laird's Scotch Whiskey. 2 x vintage used "LIPTONS TEA" ADVERTISING SERIES POSTCARDS CEYLON Both have been postally used. ‘Loading bullock carts Dambatenne Factory, Ceylon’ dated 12.09.08. In good clean condition with no creasing however it does have corner indentations from being in an album. The postage stamp has been removed. ‘View on Ceylon Tea Estate’ Half penny stamp date stamped MR 11 09. Light creasing to the postcard with a bent corner & worn edges. Please see photos. West Midlands. In Front of Almshouses. Cadbury's Bournville. Please review scans carefully to evaluate condition. You will receive the exact card pictured in the scans. This is a vintage card; due to the age you may expect to see signs of handling such as soiling, ink, bumped edges or corners, or light creasing. Please use the magnification tool to inspect the card closely! If you have any questions, please ask. Approximately 3.5" by 5.5". We are glad to combine your shipping charges for you! Thanks for looking!. 1950s JOSTEN'S CLASS RINGS Advertising Postcard "Harvard Student Agencies" Mass. (You will receive a friendly answer very soon!). (It is not on the card). THIS 4X6 CARD IS USED AND CORNERS LITTLE FOLDED WITH FRENCH INFORMATIONS ON BACK AND YELLOW MARK ON BACK. Showing Sales Rep Jack McGaughey. The corners have very light wear. The image is bright and clean. The corners have very light wear. The image is bright and clean. PM 1911 with stamp intact.Excellent. MINT- as if freshly printed (rare).EXCELLENT- with only light corner/edge wear.VERY GOOD- may have corner/ edge wear, light marks, light surface wear, light soil, light bends/creases.GOOD- may have corner/edge wear, moderate marks, moderate surface wear, moderate soil, moderate bends/creases and other imperfections as described. Unused Old Postcard. I have kept them for more than 10 to 20 years. Due to storage, there are yellowish dots, patches and stains on the postcards. Great for collection purpose. :). The card is in a good plus condition. Make Supersized seem small. Get images that. 5 Cards Rest of World £10.00 (value £26 or more). 1 – 4 Cards Rest of World £8.00 (value £26 or more). 5 Cards Rest of World £4.00 (value £25 or less). Auburn, IN. Minimal wear. We will always list any specific flaws that need pointing out that we see.